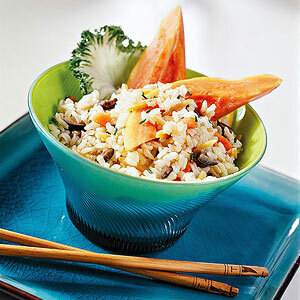 In a large bowl combine cooked rice, papaya, olives, chives, vinegar, and oil; toss to combine. Serve immediately or cover and chill for up to 6 hours. Just before serving, stir in almonds. Serve on lettuce-lined plates with papaya wedges. * To cook brown rice, in a medium saucepan bring 2 cups water and 1/4 teaspoon salt to boiling. Add 1 cup rice. Return to boiling. Reduce heat and simmer, covered, for 45 minutes. Let stand for 5 minutes. If desired, cover and chill for up to 3 days. PER SERVING: 357 cal., 12 g total fat (2 g sat. fat), 55 mg sodium, 57 g carb. (5 g fiber), 8 g pro.